Like other modern browsers, Firefox includes a few features that send your data over the Internet. Firefox contacts Mozilla, Yahoo, and Google’s servers by default. We don’t recommend you disable all these features, as they do useful things. But we’ll explain what the various options are so you can make informed decisions. If you just want to browse privately without leaving tracks on your own PC, open a private browsing window by clicking menu > New Private Window. When you open a new tab, Firefox will show you a page with links to websites. These include both your “top sites”—websites you frequently visit—and sites Mozilla suggests. Mozilla previously used the suggested sites feature to display sponsored advertisements on Firefox’s new tab page, but now just uses it for “content discovery“. To prevent Firefox from fetching and displaying suggested sites, click the gear icon at the top right corner of the new tab page and uncheck “Include suggested sites”. You can also select “Show blank page” in this menu if you just want to see a blank page. Other options are available in Firefox’s Options window. Click menu > Options to open it. When you type in Firefox’s search box, Firefox sends your keystrokes as you’re typing to your search engine—Yahoo by default. Your search engine shows you suggested searches in the box as you’re typing. If you don’t like this, you can select the “Search” category on Firefox’s options page and uncheck the “Provide search suggestions” checkbox. Firefox won’t send your searches to any search engine until you press Enter. By default, Firefox does not send what you type in your address bar to your search engine for suggestions. However, if you enable the “Show search suggestions in location bar results” option, you’ll also see search suggestions when typing in Firefox’s address bar. Use Tracking Protection in Private Windows: Firefox automatically enables a tracking protection list that blocks web trackers, but only when you use a private browsing window. You can click “Change Blocklist” to select a more aggressive tracking protection list than the default. If you disable this feature, Firefox won’t block tracking sites in private browsing windows. Manage your Do Not Track settings: Firefox automatically sends a “do not track” request with your web browsing traffic when you use a private browsing window. You can click the “Manage your Do Not Track settings” link here and tell Firefox to send a “Do Not Track” request to every website you visit. However, this is just a request, and most websites will ignore it. “Do not track” isn’t a silver bullet. History: By default, Firefox will always remember your history and allow websites to set cookies. If you like, you can set Firefox to “never remember history” and Firefox will permanently be in private browsing mode. You can also select “Use custom settings for history”. If you do, you can configure exactly how Firefox functions. For example, you could tell Firefox to not accept third-party cookies, which are often from advertising networks, or automatically clear your history when you close Firefox. Bear in mind that automatically clearing your cookies or enabling permanent private browsing mode will cause you to be logged out of websites whenever you close your browser and will generally make the web more annoying. Location Bar: Firefox will automatically suggest websites based on your browsing history, bookmarks, and open tabs when you type in the address bar. This could potentially display sensitive websites you might not want other people to see over your shoulder when you type in your address bar, so you can disable it. Firefox doesn’t send your history or bookmarks to a server for this feature—it all happens on your local PC. This option just helps prevent sensitive websites from being suggested when you type in your location bar. The Security pane controls Firefox’s use of the Google Safe Browsing service. Block dangerous and deceptive content: Firefox automatically downloads a list of dangerous web page addresses from Google every 30 minutes or so when this feature is enabled. When you visit a web page, Firefox checks the address of the site against this file and blocks it if it matches a known-dangerous site. If a site you visit matches the list, Firefox will send the exact address of the web page Google’s Safe Browsing service to confirm that it’s dangerous before blocking it. Firefox only sends the address of a web page you’re visiting to Google’s servers if it appears to match a dangerous site on the list. Block dangerous downloads: When you download an application file, Firefox will block the file immediately if its address appears on the list of bad websites. If it doesn’t, Firefox will send information about the program you’re downloading to Google’s Safe Browsing service to check whether it’s safe or whether it contains malware. On Windows, Firefox only sends data about the application to Google if it doesn’t have a known good publisher, so data won’t be sent if you’re downloading software from a trusted company like Microsoft or Google. Warn me about unwanted and uncommon software: This option causes Firefox to warn you before you download software that contains “potentially unwanted programs”, or PUPs. It works in the same way as the “Block dangerous downloads” option. We recommend you leave all these options enabled. They help protect you from phishing websites, malicious web pages, malware downloads, and junk programs you don’t want to install. Firefox automatically syncs your open tabs, bookmarks, history entries, add-ons, passwords, and preferences between your devices if you sign in with a Firefox Account. Your data will be stored online on Mozilla’s servers so you can access it on any device, and you can quickly restore your browser data on a new PC just by signing in with the same Firefox account. To control exactly what Firefox syncs, head to the “Sync” pane on Firefox’s options window and choose your options. You can also disconnect a Firefox account from here to stop syncing everything. If you don’t have an account set up here, Firefox won’t sync your browser data with Mozilla’s servers. More options are available on the “Advanced” pane. Under the “Data Choices” tab, you can choose which information Firefox shares with Mozilla. 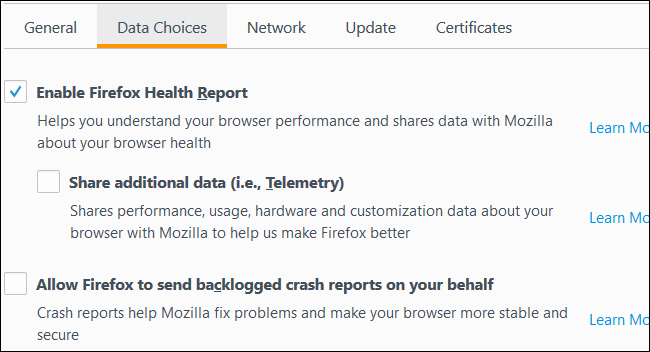 Enable Firefox Health Report: Firefox monitors your browser health, including details like how long Firefox takes to start up and how much it crashes. Firefox shares this information with Mozilla so Mozilla can understand how Firefox is performing in the real world. You can also view it yourself by clicking menu > Help > Firefox Health Report. If you disable this option, Firefox will stop monitoring itself and sharing this basic data with Mozilla. Share additional data (i.e., Telemetry): This option is off by default, but you can enable it. If you do, Firefox will also share additional details with Mozilla, including how Firefox performs, what features you use, how you’ve customized your browser, and what hardware is in your PC. Mozilla can use this information to see how people are using Firefox and improve it. Allow Firefox to send backlogged crash reports on your behalf: This option is off by default, but you can enable it. If you do, Firefox will automatically send crash reports to Mozilla. These reports are generated after Firefox crashes and include information Mozilla can use to diagnose the problem, learn how many people are encountering the issue, and fix it. Under Advanced > Updates, you can choose whether Firefox automatically installs updates or not. We strongly recommend you leave this option alone and allow Firefox to update itself. If you don’t, you won’t get critical security updates and malicious web pages you visit will be able to attack your computer through your browser. Automatic web browser security updates are critical for staying secure online.